This Sopwith Snipe show one of the many colour schemes used by pilots during W.W.1. SP-AA is the first licence-built Russian Mil' MI-1 (N.A.T.O. 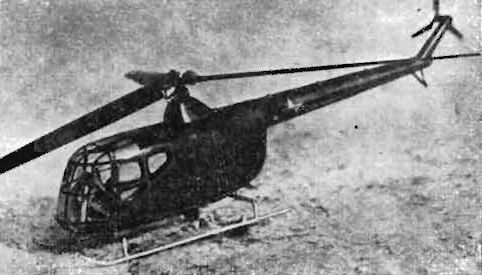 "Hare") three-seat general utility helicopter now in production as the SM-1 at Swidnik works of W.S.K.- the Transport Vehicle Manufacturing Commission. The SM-1 is powered by a 575h.p. Polish-built Russian AI-26V radial engine giving a maximum speed of 105 m.p.h. Bearing white-backed fuselage markings reminiscent of the 1920s, this Venezuelan-registered Curtiss C-46A Commando is seen here at Miami International Airport after a ferrying flight half-way across the world. What makes these flights significant is that after the minimum required overhaul these C-46s take the air with the minimum crew - often a sole pilot/navigator/engineer for hops of up to 2,500 miles non-stop. Extra fuel tanks are placed in the fuselage and the pilot has to trim the C-46 and hand-pump fuel to the main wing tanks. As the trim alters so the pilot has to judge how soon he should be back at the controls. The route is often from Karachi over the Indian Ocean to East Africa and thence across the continent and over the South Atlantic. This Sopwith Camel show one of the many colour schemes used by pilots during W.W.1. 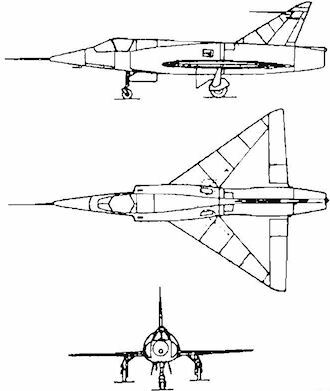 The Dassault Mirage III, first flown on 18th November, 1956, is expected to attain level speeds of Mach 1.5 and over at high altitude. Various armaments are proposed including a single MATRA self-homing air-to-air missile carried under the fuselage. The mixed Anglo-American markings on the Kittyhawk. The mixed Anglo-American markings on the Spitfire. FRENCH GANNETS. 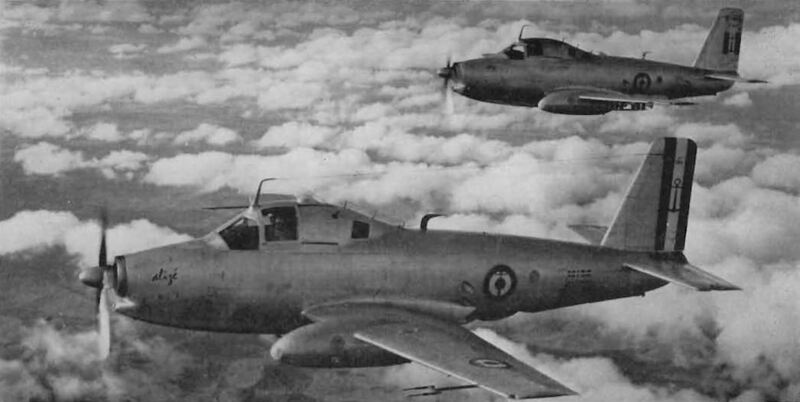 First photograph of the first two prototypes of the Dart-powered three-seat anti-submarine Breguet Br.1050 Alize which is now entering production for the French Navy. The second prototype, the Br.1050-2 (foreground) has several detail modifications noticeable - the rear fuselage dive brake shape, and repositioning of dorsal excrescences. Details of the Alize are as follows: Low-wing, three-seat, carrier-borne Anti-Submarine Aircraft, powered by one Rolls-Royce Dart R.Da.7 turboprop engine of 1,900 e.h.p . Armed with various ordnance loads, including bombs, rockets, depth charges and homing torpedoes. A retractable "dustbin"-type radome similar to that of the Fairey Gannet is installed aft of the wing trailing edge. Span 51 ft. 2 in. ; length 44 ft. II in. ; height 17 ft. 0 in. Gross weight 18,000 lb. (approx.). Maximum speed at sea-level 250 m.p.h. (approx.). 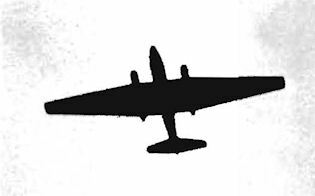 First photograph of the Martin B-57D high-altitude reconnaissance aircraft. The span is over 80 ft. and Pratt & Whitney J57 turbojets replace the Wright J65s of standard models. The Helio H-392 Strato-Courier is basically a modified H-391 Courier with a supercharged Lycoming GSO-480-AIA6 340-h.p. engine replacing the 260-h .p. Lycoming. 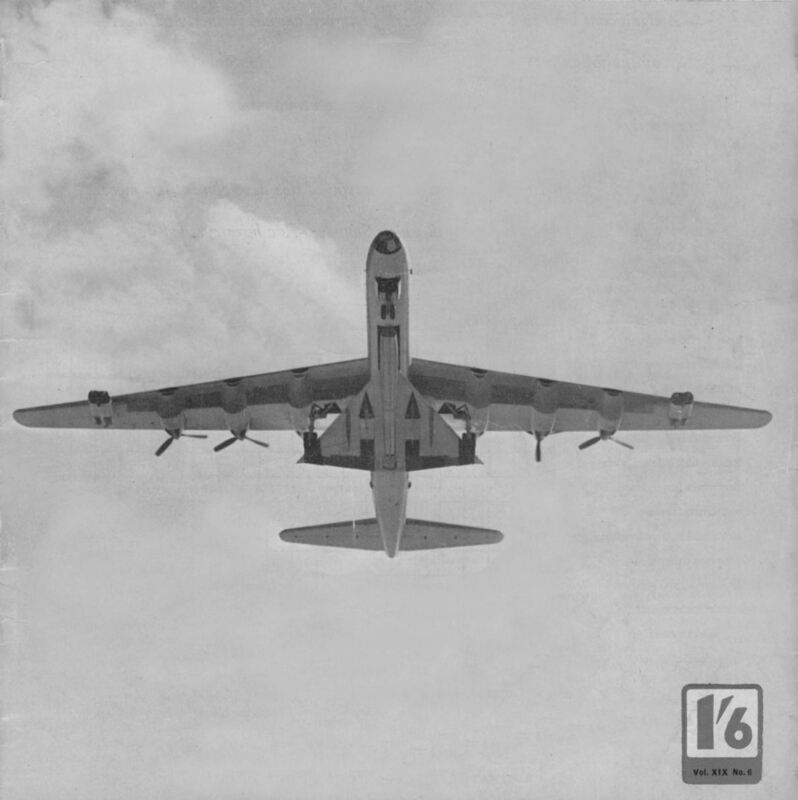 This Convair B-36 bomber carried the the prototype of the B-58 Hustler minus engines - from Fort Worth, Texas, to Daytown, Ohio. To accommodate the B-58 under its belly, the B-36 had to have two inboard propellers removed and could not retract its landing gear during the whole flight. Although it has not flown for over twenty-five years, the former skywriting S.E.SA, G-EBIA, still exists, and is being rebuilt for flying by the R.A.E. Farnborough. First photograph to be published of the Javelin F(AW) Mk. 5 shows that it differs little from the Mk.1, externally. 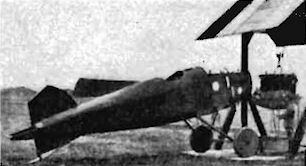 First photograph of the Czech licence-built YaK-11 (N.A.T.O. "Moose") which has been given the Czech military designation C-11. 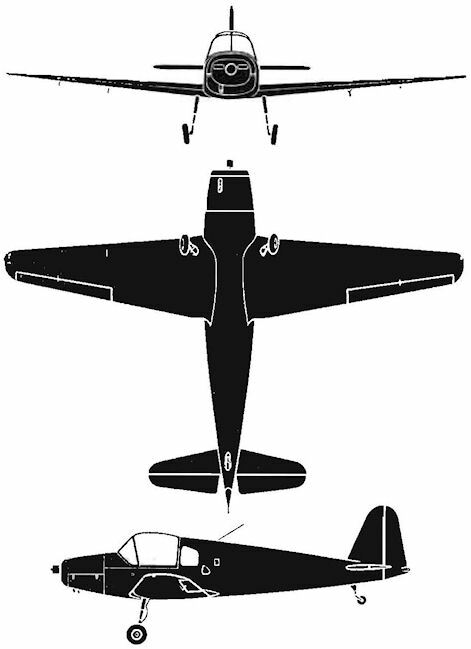 Another Version with a nosewheel undercarriage (YaK-11U) is known as the C-11U. Power, one 700-730-h.p. ASh-21. Maximum speed at sea-level, 295 m.p.h. BARRIER BUSTER. 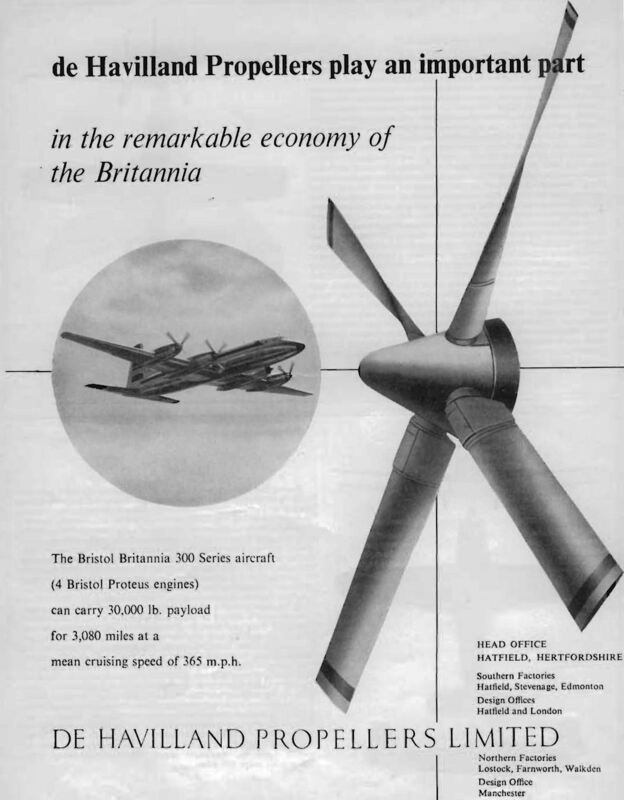 The English Electric P.1B made its first flight on Thursday, 5th April 1957, and the first photograph to be released shows a number of detail differences between the IB and the lA. Most noticeable is the now fashionable dorsal spine running from cockpit to fin. Fin area is larger and the rudder is slightly smaller and inset. 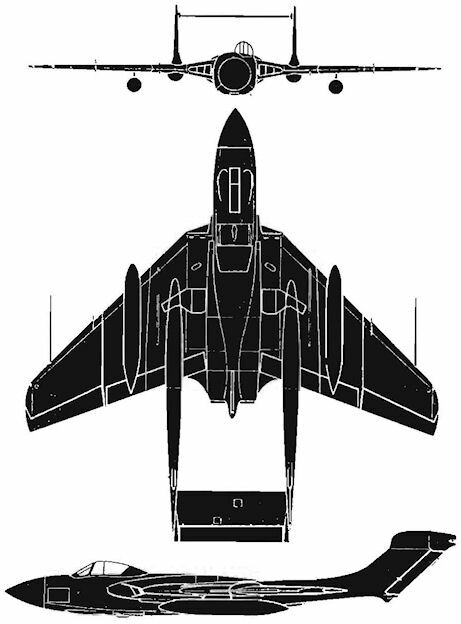 Jet effluxes have been altered and entirely new is the radio mast on the fuselage spine. Not visible in this photograph is the shock wave cone set in the jet air intake. The cone is adjustable for supersonic and high-speed flight, and the prototype IB has a large probe fitted. Two Rolls-Royce reheat Avons give the aircraft a top speed in the region of 1,500 m.p.h. A total of 100 IBs are on order, including 20 fully equipped pre-production aircraft which will be used for development purposes. Enforced abandonment of the Hunting-Clan colonial services and an industrial dispute in France have provided London Airport with such unusual creatures as Icelandic Viscounts and Sud Est 2010 Armagnacs. The colourful Convair 340. HZ-ABA (c /n. 222), of Saudi Arabian Airlines, has passed through Blackbushe en route to Tollerton for overhaul. The Vickers Valiant, serialled WP210, sports an array of aerials on the underside of the fuselage. The D.III carrying the same P.A.F. Reg. No. 237, after completion of acceptance flights in Krakow (Cracoov), summer 1920. From our Warsaw contemporary Skrzydlata Polska comes this photograph of the latest version of the Russian MI-1. Most striking modification is the now nonstepped nose transparency. Was the Bell X-2 design finalised in 1947 as stated by Ch. H. Paris in his letter above , or was it pure guesswork on the artist's part ? The HDM.105 is the second aircraft within recent years to receive a dead registration, enabling significant initials to be used for publicity. The authentic G-AHDM was the former Westminster Airways Halton (c/n. 1312, ex-PP228), disfigured at Blackbushe in 1950 to become the bogus "Reindeer G-AFOH" for the film "No Highway". FRATI F.8L FALCO. The Frati F.8 Falco, designed by Stelio Frati and constructed by Aviamilano, flew for the first time on 15th June 1955. Powered by a 90-h .p. Continental C90 engine, the exceptionally clean lines of the Falco gave it an unusually high performance. 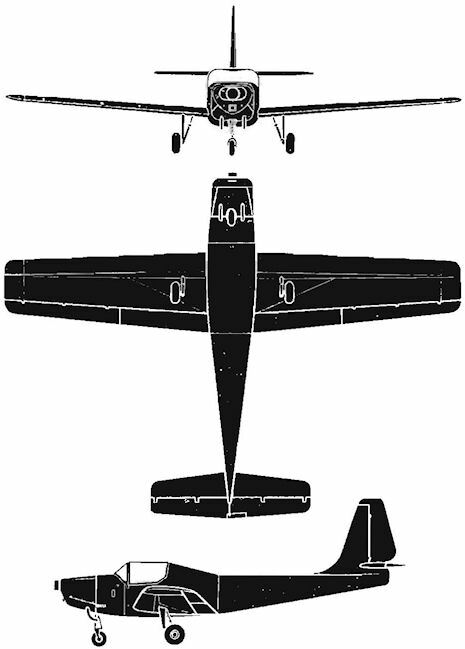 The F.8L Falco is derived directly from the F.8 but differs in having a 140-h.p. Lycoming O-290-D2B engine, a larger wing (26 ft. 2 in ., compared with 25 ft. 8in.) and greater length (21 ft. 4 in. to 21 ft.). Seating is for two, side by side, under an entirely transparent plastic sliding canopy. The nosewheel undercarriage is electrically retracted, with a mechanical stand-by. The prototype 8L had bulged undercarriage doors but these will be flattened on later production models . In straight and level flight a production aircraft with flattened undercarriage doors has exceeded 200 m.p.h. and 250 m.p.h. in a dive. Full blind-flying instruments, V.H.F. radio and A.D.F. can be fitted, and there is ample baggage space. Nosewheel is steered from the rudder pedals and both mainwheel brakes are applied together by a pedal between the rudder pedals. The fuselage is a typical all-wood monocoque structure and is plywood covered. 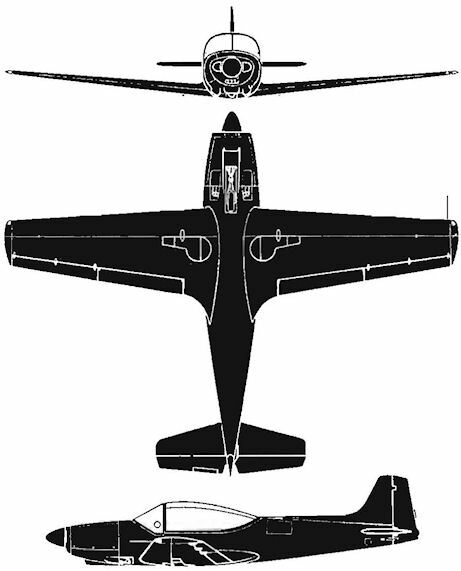 The low-wing cantilever monoplane features a laminar-flow NACA section and is of all-wooden construction built integrally with the forward portion of the fuselage. The wing is plywood-covered and the ailerons and flaps are all wood. Tail unit is of the cantilever monoplane type built integral with the rear fuselage. Tailplane and fin are plywood covered. and the rudder and elevator fabric covered. Main details are : span 26 ft. 3 in ., length 21 ft . 4 in ., height 7 ft ., weight empty 1.010 lb ., loaded 1.540 lb . Performance: maximum speed 212 m.p.h ., cruising 187 m.p.h ., range 620 miles. Essex now has two sets of Class B registrations, the well-known G-43 of the EP-9s, and G-41-1 which appeared for the first time when the Aviation Traders Accountant had its first airing at Southend on 19th April. First flight of the CL-28 "Argus" took place on 28th March 1957. The Breguet 1100-01 exceeded Mach 1.0 on its first flight. It is powered by two Turbomeca Gazibo turbojets, but the second prototype, a naval version, will be powered with a Bristol Orpheus engine. From the American Helicopter Society comes this photograph of the Model 10-A Monte-Copter. Prototype is powered by a Lycoming VO-435 engine which drives compressed air up the rotor shaft, along the blades and out of nozzles at the blade ends. Flight testing should take place at the end of this month. XL-17 "MUSANG". The XL-17 " Musang" (Wildcat) is the fourth aircraft in the series designed and constructed by the Institute of Science and Technology of Manila in the Philippine Republic, and is part of a programme to test the application of local materials, such as home-grown woods, to aircraft structure . During their experiments the Institute developed a material which it called "Wobex". "Wobex" consists of diagonally woven strips of thin bamboo glued together, made air tight and leakproof, and finished on the surface with a layer of fine sawdust and glue. Its main use is as a stressed skin covering . The XL-17 is a light side-by-side two-seat low-wing monoplane, intended for training and air touring, and is powered by a Lycoming O-245-C1 engine of 108 h.p. driving a fixed-pitch wooden propeller. Fuselage is a one-piece semimonocoque structure with wooden bulkheads and stringers covered by a "Wobex " skin, which in turn is covered with fabric for final finishing and polishing . Fuel tanks are fitted aft of the seats and the rest of the fuselage space can be used as either a radio compartment or as baggage space . The engine mount is the standard truss-type with attachments at four points to the firewall bulkhead, which is reinforced for the attachment of the nose landing gear. The cantilever wing is trapezoid in form and of one-piece construction that tapers in chord and length. It is made up of one main and one auxiliary spar of box-type construction and reinforced diagonal spar. The leading edge is covered with a thick plywood covering to take torsional and chordwise shear loads. Overall wing covering is fabric. Slotted type ailerons are fitted and simple split flaps are located under the wings between the ailerons and the fuselage. The wing root upper section upper covering is reinforced to serve as a step and walkway to the cockpit. A tricycle undercarriage is fitted, the main gear to the main wing spars and the nose gear to the firewall bulkhead. General dimensions are : span 31 ft. 6in., length 23 ft. 4 in ., height 6 ft . 8 in .. maximum speed 125 m.p.h ., cruising 105 m.p.h. A floatplane version is now being designed . 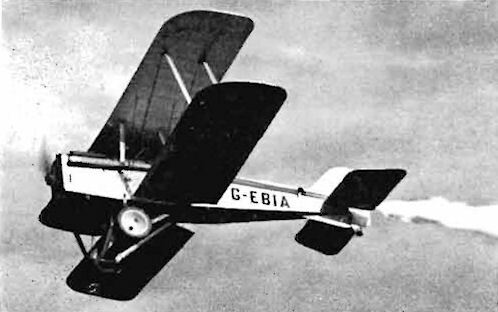 Constructed in 1908, this unique aircraft utilised several unusual features including a tilting engine and a shrouded propeller.